As you may know I love food, I love friends and I love the combination of the two. We decided to throw a dinner party with 3 courses of goodness. I was responsible for the pudding, which was a chocolate pot – but I made them in a muffin tin which was a splendid way to make them. Amels and JayJay and Haylz and bRad were the guests. Rikki was responsible for the delish starter and main. We had some awesome wine and wonderful company to go with it all. Starters were fishcakes on a homemade pickled veg. The fishcakes were probably some of the best I’ve eaten because they were so fresh and the perfect balance between crunch, sweet and sour and the soft fish flesh. We’d grilled some fresh hake fillets seasoned with salt and pepper, once they had cooled a bit we flaked them and mixed them together with mashed potato, fresh coriander and some other herbs and spices. Once ready to serve they were dusted in flour and and fried in oil. Rikki had made his own pickled veg with some cucumber, peppers and a bunch of other yummy goodness. We’d also made a garlic mayo to go with it – totally delish and moreish. 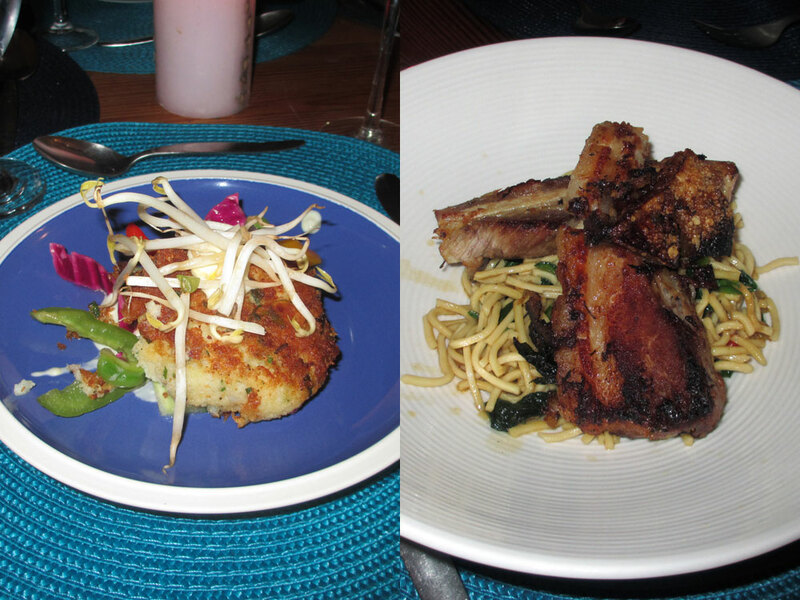 Main course is possibly one of my most favourite cuts of meat – pork belly! Oh my goodness I could eat this for days and Rikki has this dish down to perfection. Roasted and crisped up on the outer edges and yummy and tender in the middle. Served on some egg noodles tossed in soya sauce and some other goodness this was simply yum. Happy. Thank You. More Please! So looking forward to more of these kinds of dinners! 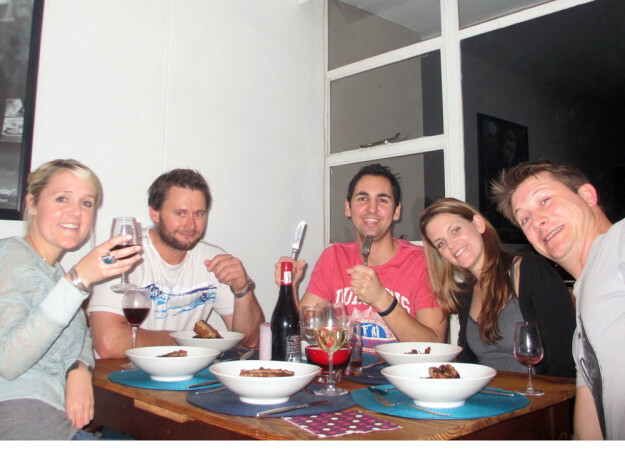 This entry was posted in Eat and tagged dinner party, dinner with friends, good food, yummy delish.